Register now and you get the first 20 faxes for free!! An easy and economic way to send a fax. For only R0,99 you can send yor fax with minimal effort. 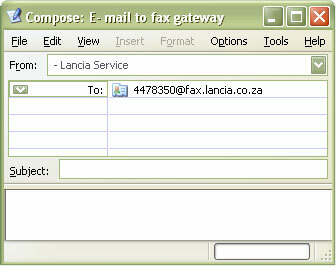 You no longer need to spend time standing at the fax machine trying to get that fax delivered, simply E-mail it! Monthly billing. If you don't fax anything, you don't pay anything! The most conveniant and portable document format is PDF. We encourage using PDF when sending your documents. You can download the PDF Creator here: a simple application that allows to to set up a PDF printer.